The Links Hall Collection contains recordings of over 135 events of spoken word, performance, and music that took place at Chicago's Links Hall, a multi-disciplinary project space founded in 1978 by Bob Eisen, Carol Bobrow, and Charlie Vernon. 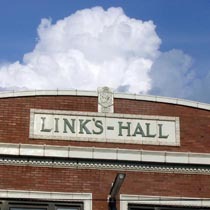 In 1985, Links Hall artistic director Michael Zerang initiated the The Links Hall Performance Series, a curated series that expanded Links Hall programming of dance and movement to include contemporary and experimental music, traditional ethnic folk music, literary readings, and performance art. The Performance Series was initiated to provide artists a consistent performance venue dedicated to the exhibition and dissemination of diverse artistic genres. Through the inception of the Performance Series, Links Hall provided Chicago audiences a series of events to experience the creative output of emerging musical, literary, and performance artists. Although the Performance Series began in 1985, unattended recordings created by Michael Zerang in a VHS audio format began in 1987. These recordings form the bulk of CAA's Links Hall Performance Series archive. In 1989, Jim de Jong took over Zerang's role as artistic director. The collection reflects Zerang's extensive holdings of recorded material from unattended recordings that began in 1987.